I know I say this about most novels that I have been reviewing lately, but I loved GONE by Michael Grant. Lately I have been reading really amazing books, and I have been wanting to read books that I know won’t be good since I can show you how I am not just reviewing the good books that I read. I am honestly reading just amazing books lately. 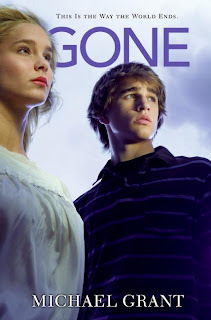 GONE is one of those novels that you just have to read. You are missing out on some amusingness if you do not pick up this novel this moment. The plot, and I am not kidding, is one of the most unique and unheard of plots that I have ever read or even heard of. Before I picked this novel up, all I knew that it has been getting amazing reviews by every huge blogger that I know (for example, The Story Siren,) and I knew that sooner or later I would have to pick this novel up. It wasn’t until I saw the huge lettering on the spin in my school library that I was totally serious about reading it. I loved GONE. Can I say that enough? For any of those crazy people who have not read this book, you must pick it up now. There was everything that you could ever possibly want in a novel. Like able characters, amazing writing style, and much more! The cover of GONE is not my favourite and I honestly don’t get it. There are just a bunch of random people standing staring off into space. I am guessing that the people are characters from the book, but it is not obvious which ones. I love that it is a wrap around cover, though. I find that whenever I find a book with a wrap around cover, I fall in love with it. I don’t know for certain why though. Maybe not a lot of books have wrap around covers? I have no idea. Like I said, if you are one of those crazy people who have not read GONE, than you must go to your nearest book store and buy it. Right now. Because it is amazing. Hello guys! I just posted in my mailbox, but I decided to post another post for you guys since it has been awhile since I have posted. I am going to try some new rating scale type thing. I will still be doing the percentage scale type thing, but I will be adding a A and B scale to it. 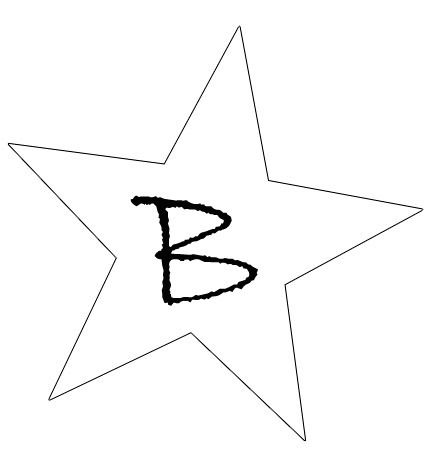 If a book's percentage is from 0-50, it is rated a B. If a book is from 51-100, it is rated and A. I decided to only use As and Bs because I wanted to have an even group of numbers (sort of, it is hard to explain). So, what do you guys think? I personally think that it is genius. Not to be full of myself or anything. I just think it is a really good idea and that is why I am using it. I want to know what you guys think, though, because my followers are really important to me too, and I want to know when you like something or other. I would really love to know. Hey guys! I am sorry I have kind of been away for a little while, but I am back now! I just have been super busy with school and such that I haven't had much time for blogging purposes. But, here is IMM! In my mailbox is a weekly meme hosted by Kristi over at the Story Siren. It allows readers and bloggers to drool over new books and swag! I had an awesome week this week for in my mailbox. I received my first book that an author has wanted me to review! My first review copy! For me, this is super exciting and I couldn't wait to share it with you guys! Want to know what it is? It is Solid by Shelley Workinger! I am currently reading this, so a review for it should be up soon. I was excited to get this because this is my first book by an indie author, so I was excited to check one out. That is all for me this week. My mailbox was certainly happy, and my question is, what did you get this week? In My Mailbox is a weekley meme hosted by The Story Siren. It gives readers a chance to drool over new books. But there will definatly be something waiting for you guys next week! Author Interview with Ellen Hopkins! Hey guys, I have another author interview for you guys! This time it is with Ellen Hopkins, the author of IMPULSE, which I reviewed on my blog a little while ago. I hope you enjoy! 1. What was it like growing up in adopted family? My parents were older, so any differences between an adopted family and a birth family stemmed from that. We didn't do things like ski, for instance. But I had a great childhood. 2. Why did you decide to write your novels in verse? I started CRANK in prose, but the voice was too angry. It was my voice, not “Kristina’s” voice. I’ve always written poetry and when I saw another verse novelist, Sonya Sones, speak at a conference, I knew it was the right way to tell the story. Verse is about how the poet views his or her world, and I wanted to view Kristina’s world. Verse allowed me inside her. Then I discovered a talent for it, and that many readers do like it. 3. What is your favourite colour? 4. Any new projects you can tell us about? Please see my FAQ page on ellenhopkins.com.....news on upcoming projects is on the home page. 5. Did you have any say in your beautiful cover art? Not really, except for some input on color. My cover designer, Sammy Yuen Jr., is brilliant. I'm happy with his choices. 6. How long did it take you to write Impulse? 7. How long did it take you to write Crank? 8. How long did it take you to write Glass? CRANK took me about a year and a lot of that was developing the format. The others took around 6-8 months. 10. Thank you so much for the interview. 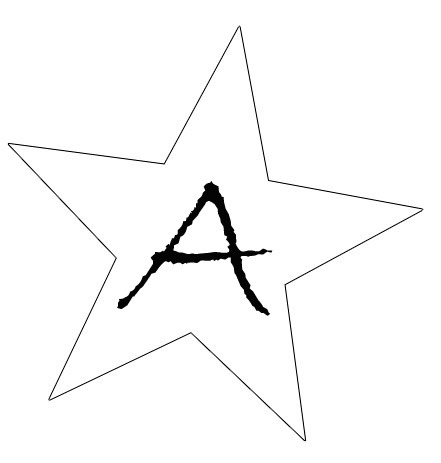 One last question, what is your biggest advice for aspiring authors? To read, read, read. And read cross-genre. And to write, write, write. And to write cross-genre. You won't know where you belong as a writer until you try lots of different kinds of writing. Not everyone is a novelist or a poet, or belongs writing Dystopian. Experiment! Thanks so much to Ellen Hopkins for the wonderful interview! I love your novels and I can't wait for upcoming projects! Author Interview with Diane Chamberlain! 1. You are the first adult author that I have reviewed on my blog. How does that make you feel? I’m honored that you were willing to give one of my books a try and that you enjoyed it enough that you wanted to chat with me about it. 2. Before The Storm is a novel that covers many topic that I love to read about, (crime, love, loss, ect.) what was the inspiration for this novel? I came up with the setting before I came up with the story. I visited Topsail Island, North Carolina for an ‘authors and readers’ event and fell in love with it and knew I wanted to set a story there. Around the same time, I had an idea for a story involving an “unlikely hero,” an unpopular boy who rescues people from a fire. That’s how Andy was born. When I first “heard” Andy speak in my mind, I recognized his voice as similar to that of children I used to work with as a psychotherapist and knew he had fetal alcohol syndrome. The way he spoke reminded me of those children. But that meant I had to come up with a reason why his mother, Laurel, drank while she was pregnant with him. Plotting is like that—it’s circular. You think of one idea and then have to puzzle out how to fit that idea into the story. I love solving those problems. Another scene that was very strong in my mind even before I started writing Before the Storm was the scene with Andy’s sister, Maggie, sitting on the demolished porch of an old beach house, communing with the spirit of her father who had been killed by a whale. I loved that scene, but I didn’t know what it meant until I wrote some of the story. I wrote a few truly terrible books when I was twelve, but then I forgot about writing until I was in my early thirties and in the midst of a career as a social worker and psychotherapist working in hospitals and a private practice with teenagers. I’ve been at it more than twenty years. 4. What made you want to write adult novels? Or did it just end up like that? 5. How old were you when you started writing novels? 7. How long did it take you to write Before the Storm? 8. In your own words, summarize Before the Storm. I think of Before the Storm as part mystery, part suspense and one hundred percent family drama. It’s the story of how far a family will go to protect one another. It’s about the choices people make that come back to haunt them. And it’s about the gradual unfolding of truths that keep the characters on edge and those pages turning. 9. Did you have any say in your novel covers? Authors have very little say in their covers, unfortunately. I like most of my covers, but not all of them. 10. Is there any other projects that you are working on right now that you can tell us about? The book I just finished is called The Midwife’s Confession. It will be out in the United States in May, and yes, there are a few teenage characters in the story! 11. Thank you so much for the wonderful interview. One last question, what is your biggest advice for aspiring authors? My advice is to learn all you can about the craft of writing. Learn the basics of grammar and punctuation and how to string words together in a way that makes sense and sounds good. You really need to know all of that to tell a great story. And then you need to figure out that great story to tell! My strongest advice is to not give up. If you love writing and have a tale to tell, just keep working at it until you get it right. Thank you so much Diane Chamberlain for the wonderful interview! You answered so many questions that I had rolling around in my head when I finished Before the Storm. 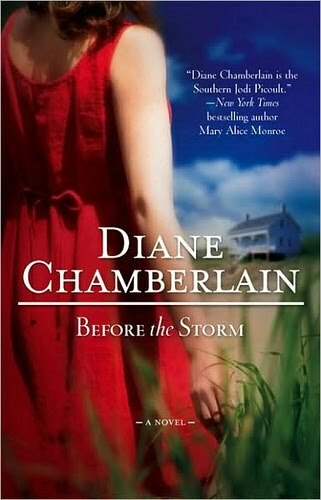 Also, I would like to add to Diane Chamberlain's comment on my review of Before the Storm, that I did know that there is a sequel and I should be reading that soon because I love her books! Once again, I thank Diane so much for the wonderful interview and I would like to inform you guys that I will be featured on her blog sometime soon! I will let you guys know more about that at a later date and hopefully that will be sooner rather than later! In my Mailbox is a weekly meme hosted by the Story Siren. It allows bloggers to drool over new books. No new books for me this week, but I did re-new GONE by Michael Grant, and I also have an exciting thing coming soon, so I hope that will be here in about two weeks or so. Three teens who have attempted suicide meet in a psychiatric hospital, battle their demons, and begin to heal. The handsome son of wealthy parents, Connor has everything anyone could want-except his family's love and affection. Jailed for years after killing his mother's child-molesting boyfriend, Tony is confused about his sexuality. Manic-depressive Vanessa cuts herself. All three stories intertwine in a brutally honest story about pain and resilience. I am going to try something a little different in this review. I will try a different format than any other review I have done. Just read and see. 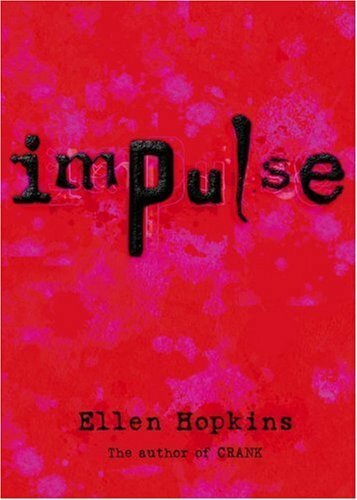 IMPULSE by Ellen Hopkins was one of those books that you truly really didn’t expect to pick up at that certain moment. I picked it up when my local Wal-Mart was having their anniversary sale going on. We had just happened to go in there because my sister was looking for a new keyboard for her laptop. I had to look at the book section, to see if there was any books that just happened to be there that I really wanted to get (this has happened before) and I saw that most of the books had a red sticker on them. Some of them said 2 for 15, some said 2 for 20, and some said 2 for 30. I was stoked. I saw Impulse on the shelf, and that was the first one I picked up. I have read CRANK and GLASS by Ellen Hopkins, and I knew that I wanted to read more of her work. So when I saw IMPULSE on the shelf, I knew that I needed to get it. IMPULSE was a wonderful novel. I will say, though, that it is not a favourite of mine, but I still really liked it. The whole suicidal teens thing has been done before, but Ellen Hopkins has done it in a different way than any other suicide novel that I have ever read before. With her writing in verse, it just pulled it another level that I never thought any author could pull it before, until I read IMPULSE. I do believe that there is another book in the series, but at the moment I can’t think of the name, but the way Ellen finished off this novel, it was the perfect way to end a novel that has another/a series book after it. It’s not a total cliff hanger, but it leaves you wondering what is going to happen next. I loved this novel, and I hope you guys enjoy it just as much as I did. It has been awhile since I have posted just a post about some updates. Well, to be honest, I haven't really had any. Until now. I was just thinking about how I could make the blog better and with more content and jazz like that. Well, I think I just came up with an idea. After every book I read, I will try to score and interview with the author. I know I may not get a interview from every single author, but it is worth a shot. Hello guys! I have made the decision that Tia’s Voice will actually be held on TUESDAY, rather than Monday, because it seems as if I can never find time on Mondays to do this. Anyways, here we go. What I am going to talk about today everybody has a different view of. Drawing on your body… that stays forever. Other wise known as tattoos. I know people who hate tattoos, and would rip my head off if they ever found me with one. And then I know people with several tattoos. It all depends on the person and how they were brought up. I personally don’t mind tattoos, I mean, it is the person’s decision that if they want to be inked and have that on their body for the rest of their lives. What do you think of tattoos? Do you have any? If you do… what of? I would love to see pictures! Please share! In my mailbox is a weekly meme hosted by Kristi over at The Story Siren. It gives readers a chance to drool over new books. This week was better than most weeks, but it is not what I would like to see. I borrowed one book from my school library, and that is it. Sad, I know. But I guess I can take what I can get. I guess that is all you can do. I freaked out when I found this in my school's library. Usually my school only has the really immature middle grade books (not the ones that us bloggers would like) so I can say that I was really surprised when I found this one. Of course I freaked out and started doing the happy dance in the middle of the library. I was so happy. I really wanted to read this one for a long time now. That is all for in my mailbox this week... what did you get in yours? It is by design that Katniss was rescued from the arena in the cruel and haunting Quarter Quell, and it is by design that she has long been part of the revolution without knowing it. District 13 has come out of the shadows and is plotting to overthrow the Capitol. Everyone, it seems, has had a hand in the carefully laid plans -- except Katniss. The success of the rebellion hinges on Katniss's willingness to be a pawn, to accept responsibility for countless lives, and to change the course of the future of Panem. To do this, she must put aside her feelings of anger and distrust. She must become the rebels' Mockingjay -- no matter what the personal cost. All of The Hunger Games novels have the most amazing plots ever. Collins has done a wonderful job in pulling all of those loose strings to pull them all together to end a perfect novel series. The fist two novel’s character development struck a ten, but for this novel I reluctantly give it a nine. Katniss was very, annoying and rude at times, and I found Peeta, oh that wonderful Peeta, to be very annoying, especially what he was doing to Katniss. This was easy to get over, though. I liked how the problem was spaced out through this novel, but I found that in the beginning it went too slow, and towards the end the pacing was too fast. There was like fifty pages left, and the problem was only at the climax, and I was saying in my mind “there is no possible way she could wrap all of this up in less than fifty pages!” That is the only main reason why this didn’t strike a ten, if it would have been more quicker picking up in the beginning and slower pace in the end, than it would have struck max points. I would like to say that I liked the end of this novel. I can’t say much about it with giving out too many spoilers, but some things in this novel I just didn’t like. The solution effectiveness just didn’t work out in this book at all. the most unique writing styles that I have ever read in my whole reading career. I loved the character development in this novel. Katniss learned to be more of an adult even though she was already acting like the adult of the family. She learned more and more by the end of this novel. Like the covers of the previous two books, I can say from the bottom of my heart that they are amazing and that I love them. If you have read the books and truly get the covers, you will know that they are genius! They did a very smart thing with the covers, not making it too obvious what they represent, but not making it impossible to figure it out. I love the whole idea of having the setting in future North America, and Collins has magically pulled together the world of future North America. Although some of the things that happened in the end, I can say that I liked it overall. I didn't like most of the things that happened. I loved how it ended overall. The beginning was slow, and it took me awhile to get through, but it was fine as soon as I got out of that little grace period. Overall, I actually did enjoy this novel. 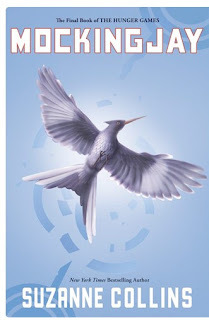 I wish Suzanne Collins will right more about this series, weather it is a spin-off series. I would also love if she would write the books in Peeta’s point of view! Hey guys. I am doing something different this Friday! Yes, something new! 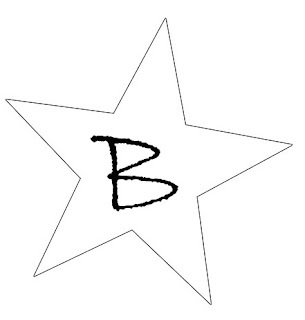 I am going to be starting Follow my book blog Friday! It is hosted bu Paragunkee, and I am brand new at this! So follow if you can, and everybody will be appreciated! And to answer her question, it all depends on if I am busy that week or not. I like to post at least one, but that never always happens. I am so sorry, guys! I know this was suppose to be up yesterday, but my computer died and I didn’t have time to write this up! I am sorry! But usually this should be posted every Monday. I hope you enjoy! Other than that crazy-hard puppy stage, naming your dog may be the hardest thing about getting a new puppy. Since you have only seen your puppy a couple times, tops, you have no idea most of the time what the dog’s personality is. So naming your puppy may be a challenge for some people. Of course you want your dog’s name to suit the breed your dog is, but some people don’t want it to be crazy fitting, if you know what I mean. Like if you are getting a golden retriever, you may not want to name it Goldie, because you may not know how many golden retrievers are named Goldie. My golden retriever’s name is Dolce, and for her I think it is fitting. It means sweet in Italian, and she is the sweetest and nicest dog you will ever meet. I wanted to name her Maya, but sadly the rest of the family didn’t love the name as much as I did. I thought Maya was perfect for a golden retriever. My family likes short names for our pets. All of our dogs have had two syllable names. All together we have had three dogs, and their names have been Zoey, Tia, and my current dog, Dolce. Maya would have also fit under that category, so I thought it was perfect. Anyways, how do you feel about naming pets? Did you find it difficult when picking out names for your pet, or did it come easy for you? How did your family decided how they were going to pick the name? Tia's Voice: What it is. Tia’s Voice: What it is. A lot of things have been changing around here, I have noticed! You may be groaning right now. “Sierra, stop changing things!” Well, this time nothing is changing. Something is starting. If you just happen to be following Melina over at Reading Vacation, and are familiar with her Third Degree meme, than I think you are really going to enjoy this that I have to present to you. I have been planning this meme for weeks. And weeks, and weeks. Trying to think of the perfect name, what exactly I am going to do, the list goes on and on. But now I can finally announce it. It’s called Tia’s Voice, a new meme started by me, Sierra. The name comes from a whole background story. My best friend, a half Springer Spaniel half hound dog, named Tia. She was my best friend. Still is. She died April 26th, 2010. Ever since she died I wanted to do something in her memory. 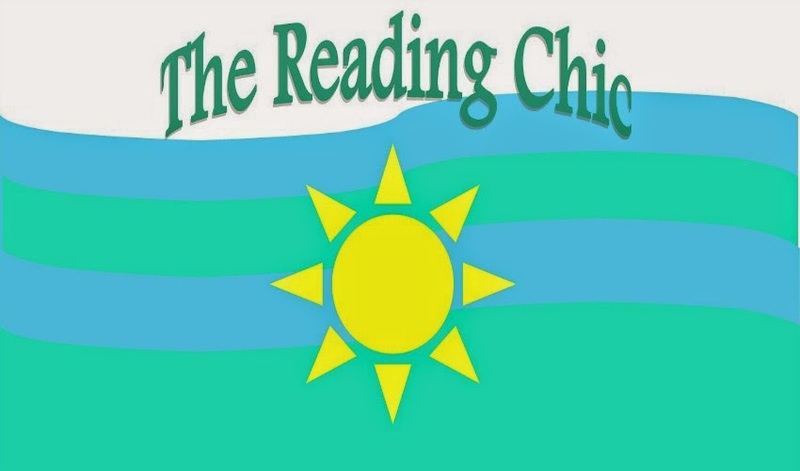 So, I started the Reading Chic. So I decided that I was going to name this meme after her. What exactly I am going to do is I am going to have one topic and I am going to talk about it basically. Give it the third degree. I am going to kick it off with one about pet names. I hope to have one posted every Monday, as it is a day that seems to work best for me and my crazy schedule. I will probably pr-write some and post it on blogger to post on the day of the next Tia’s voice, but that all depends on the spare time that I have on my hands. Thank you guys, and I do hope you enjoy Tia’s Voice, and the first post should be up shortly! My blog readers from America probably don't understand why I have a Thanksgiving header instead of a Hallowe'en header. Well, for Canada, Thanksgiving is our next holiday. We always have Thanksgiving in October. Don't ask me why, but Canada does. So since I live in Canada, Thanksgiving will be my next holiday. After Thanksgiving is over, though, I will probably immediately change it to my Hallowe'en header. I am going to have to figure out what I am going to do between holidays that are far apart, but I guess I will figure that out sooner or later. I just thought I explain that a little bit so that I don't have a million people questioning why I have a Thanksgiving header. Nope, the blog's title has not changed again. But the template and header sure have! As you may... or may not have noticed, the blog's template has totally changed again. I personally think it looks way more professional than any of the templates I have had before, and I truly do love that. It looks, to me anyways, like a professional bloggers (I don't want to be full of myself or anything, but if I do say so myself it does look very spiffy). Oh, header. I have had lots of fights with you in the past. I finally figured out how to make the whole picture go across the top of the blog! Thanks to some random blog that I found as I was researching because I don't think I am very smart when it comes to these types of things. Anyways, I guess I can share my secret with you. If you are using this general template from Blogger (Simple Blog... or something like that) and are using picnik to edit your selected picture, than what you need to do is go to edit and re-size, and you need to make it so that the size is 900 × 148 and it is the perfect size for this template. DO NOT GO ANY BIGGER OR IT WILL CUT OFF YOUR PICTURE. Just a little piece of advice. I just thought I would update since I haven't done a blog post in awhile. I have a few exciting things coming up so stay tuned for that. I am going to make this really short. In my mailbox is a weekly meme hosted by Kristi over at the Story Siren. No books this week, sadly. I really haven't gotten the chance to go to even Wal-Mart to get books. I could have gotten one at my local Zellers, but I decided not to because I didn't have a ton of money. I need to get some allowance.